It is clear after today that the level of talent throughout this county is still through the roof. The exciting action of today really proved our county's depth. Just about true with each race, if there was not an exciting finish, there was a new meet record. There were no disappointments because all of the top athletes came with their 'A' game at some point or another during the meet. Cheers and roars from captivated spectators constantly filled the Georgetown Prep Indoor Track. Today was the first ever county championship meet at Georgetown Prep and it was a smoothly run meet with a comfortable amount of room for spectators and athletes. Overall it was a great success and a nice relief from making the trek to the PG Sportsplex. The girls 4x8 followed the 55 meter dash and hurdle preliminaries. Maryam Fikri of Churchill took out the opening leg. Whitman, B-CC, and Northwest followed. Northwest Freshman Britt Eckerstrom, winner of the 4A West Regionals in Cross Country, showed her versatility and put Northwest into the lead with a strong leadoff leg. As the race progressed, lack of depth became a repetitive sign of weakness as Northwest, B-CC and Whitman fell back. Churchill remained up front until the anchor legs received their batons. Last year in outdoor track, this was a reoccurring sequence: Churchill would get the baton with a large lead over Whitman and Morrison would catch up and pass for the win. But this time around, Erin McManus anchors for Churchill and she has proven to be just about impossible to blow by. Nevertheless, Morrison caught up to McManus and with about 150 to go she made her move and began gapping her. McManus would make up some of that ground but Morrison hung on for the win with McManus following. B-CC and Northwest rounded out the top four. Whitman and Churchill's times of 9:37.25 and 9:37.98 eclipsed the previous county record of 9:37.99 set by Whitman last year. 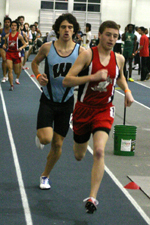 The boys 4x8 featured some interesting strategies which induced a different sort of race. Quince Orchard's Wayne Bartholomew felt the adrenaline of his first major 4x8 relay and took the field out very hard. Russell Speiden of Sherwood followed a short distance behind him and then a large pack followed about 10 meters behind. Speiden eventually caught up to Bartholomew and they both handed off at around the same time. Instead of Neal Darmody, Kris Lasko ran the second leg for QO. While Sherwood dropped back, Lasko gave Josh Joson a good lead. A pack of about three teams followed while Chris Moen received the baton for Walter Johnson in 4th. Usually, Moen anchors for Walter Johnson but the plan was for Moen to give anchor Sean O'leary an opportunity to hold onto first place. Moen wasted no time in accomplishing his endeavors. With a rough 56 first 400, Moen zipped into first place and put some distance between him and Joson. Though Joson caught Moen with about 70 meters left in their legs, Moen hung on with a 1:57 split and handed the baton off to O'leary in the lead. O'leary met his match with QO anchor David Laratta. Laratta bolted into the lead upon receiving the baton taking O'leary out in a 28 200 and 59 400. Gutsy yet unprepared, the sophomore in his first year of running ultimately dropped into 4th place. Damascus' anchor Wil Zahorodny had received the baton in 4th yet quickly made up ground. He almost ended up catching QO's Laratta but a 1:55 split was not enough. B-CC's Alex Prevost followed Zahorodny in third. Quince Orchard's 8:10 was a new county record by almost 5 seconds. Damascus's 8:11 would have been a new county record. The girls 300 featured potentially the top performer of the meet. All eyes were on Wootton's Olivia Ekpone as she dominated every event she ran in. She won the open 300 with a small gap which she established late in the race. Ekpone's time of 40.76 was .06 off of tying the previously hand-timed county record of 40.7. In the boys 300, Richard Montgomery's Brendan Etzel, too, was close to setting a new county record. With about 100 meters to go in the race, Antonio Palmer was in second and had just about made up the lane gap. Then, Etzel unleashed his finishing kick and put a 5 meter gap on the remainder of the field. Palmer faded to 3rd place. Etzel's finish shows that there can be a kick in just about any race-even a sprinting event. Perhaps he timed his kick just a little late. His time of 35.47 seconds was .37 seconds off of Bryan Steele's county record. Steele is no typical athlete, however; he currently runs for the Jamaican national team. 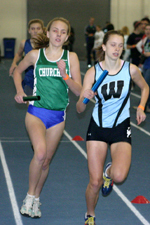 The girls 1600 featured a rematch between B-CC freshman Alex Doll and Whitman senior Morgane Gay. Last week in the Montgomery Invitational Mile, Gay out-leaned Doll at the line for a .05 second victory. This time around, Doll had no such issues. Though once again, Doll took the race out and Gay followed right behind her. Blair's Johanna Gretschel and Churchill duo Hannallah and Fikri followed a slight distance behind. Doll built her lead as Gay began dropping. Hannallah passed Gay into second about four seconds behind Doll then Whitman's Eliza Schalch, Gretschel and Eckerstrom continued the pattern. Gay ended up finishing in 7th. Hannallah kept her place in second and freshman Britt Eckerstrom followed. Doll's 5:06.9 victory was a second off the county record Gay set last year. The boys 1600 also encompassed a wire-to-wire victory. Though rare, victory in such a dominating fashion shows why Montgomery County has always produced nationally-elite runners such as Neal Darmody. Darmody took the 1600 out but knew he was not going to win without a fight as Andrew Palmer followed behind him-just like a repeat of Cross Country States. They immediately separated themselves from the rest of the field as Joson, Speiden, and Prevost followed in the chase pack. The three leaders of the chase pack would alternate position but Darmody and Palmer remained in first and second respectively. Darmody picked up the pace around the middle of the race as Palmer followed and drew a slightly bigger gap between the lead and chase packs. Palmer by the last lap; however, could not hang onto Darmody's pace any longer. The lactic acid and fatigue set in as he began to drop. As Darmody rolled to a convincing 4:28 finish, Speiden made up the large gap and moved into second place. Palmer finished third. The girls 500 included some of the county's best plus an unknown in Walter Johnson's Renee McClinton who people rarely talk about even though she is one of the county's best talents. Morrison took the race out while McClinton, Wootton's Veronica Salcido, and Churchill's Katie Wolf followed. 100 meters into the race, Wolf stumbled and nearly fell. Wolf would regain her composure as all four places would remain the same. With about 20 meters left, Wolf made her move into second moving McClinton back to third and Salcido back to 4th. Morrison won her third consecutive 500-meter county title in 1:19.07. The boys' 500 was also a one-man show. Though built up to be a duel between Wil Zahorodny and Gaithersburg's Antonio Palmer, Zahorodny stole the spotlight from the very beginning. Though Palmer typically likes to take races out, Zahorodny took the lead from the start and continued to gradually build it up. It became a race against the clock-and he won that too. His time of 1:05.09 is eclipses Bryan Steele's previous record of 1:05.8. Zahorodny's time is currently the fastest time in the United States according to Dyestat's most recent national rankings. Though outmatched in the 1600, Louise Hannallah reasserted herself as a force in the county in the 3200. Hannallah took the race out with teammate McManus and Northwest's Kathy Aherne right behind. These three formed the lead pack as the chase pack headed by B-CC's Addie Tousley, Churchill's Alex Giedd, and Whitman's Debbie Isen followed in fluctuating order. 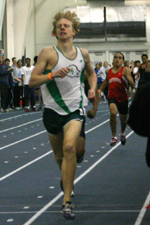 As the race strung out, Hannallah dropped McManus and Aherne about 1600 meters into the race. McManus was left alone, secure and untouched in second place. Aherne paid the price for what proved to be a quick start for her by dropping all the way to fifth. Isen and Tousley moved up into third and fourth respectively. Hannallah won for the second year in a row in 11:18. Much like the boys 1600, Neal Darmody proved to be a one-man show in the 3200. The last championship 3200 he ran was his state title run in outdoor track. However, B-CC's Dylan Straughan would not allow Darmody to roll away with another County Championship. Straughan gave his best effort to hang onto Darmody's pace and ride him for a good time in the process. Darmody split 4:50 for his first mile, and then conspicuously picked up the pace. At this point, Straughan could no longer stick with Darmody's pace, much like Palmer in the 1600 earlier. Darmody continued to extend his lead as Straughan remained alone in second. 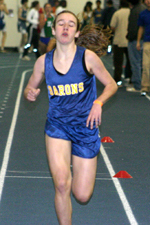 Darmody ultimately won in 9:35, a county record by 10 seconds. Straughan finished in 9:53 for second place. Out of all of the exciting events, the 4x2's attracted the most spectators and consequential noise and cheers. The girls 4x2 was first but straight to the finish is where all the excitement was. 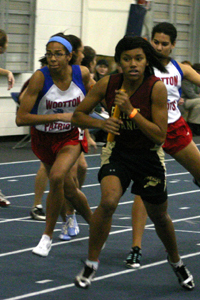 Wootton's Olivia Ekpone received the baton a split second after Paint Branch anchor Arielle Statham. If there is anyone in the county who could hold off the seemingly unstoppable Wootton freshman, it's Statham. They went step by step and dug deep down the final straightaway. Ekpone edged out Statham in the last 5 meters amidst the roars of spectators. The boys 4x2 was equally exciting. Richard Montgomery's second leg Etzel took his team into first as Blair followed. After three legs, Richard Montgomery slightly extended their lead. RM anchor Mike Rosenthal could not hang onto the lead, however. It almost appeared for a moment that RM lost the lead. Much like the finish in the girls' race, both sprinters dug deep down the final straightaway and Rosenthal was able to hang on by a mere .04. The girls' 800 proved to be a swift deviation from the perpetual excitement that had been incurring throughout the meet. Leslie Morrison led the first 400 meters in a mere 73 seconds along with teammate Morgane Gay. The pack was very tight until both teammates worked together to pick it up. Morrison won in 2:22, a negative split, with Gay right behind her. 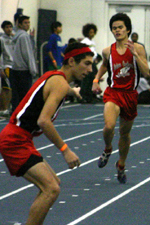 It was the third year in a row that Morrison won both the 500 and 800. The boys' 800 involved a lot of tactics. Antonio Palmer, determined not to fall behind Zahorodny early, took the lead. Zahorodny followed along with Northwood's Giovanni Reumante. Chris Moen was alone in 4th. This remained constant until the backstretch of the 3rd lap when Moen made his move and passed everybody including Palmer. They both separated themselves from the rest of pack. Palmer fought to hang onto Moen as best as he could but with about 30 meters left, Moen got out in front of Palmer and safely hung on for the win. 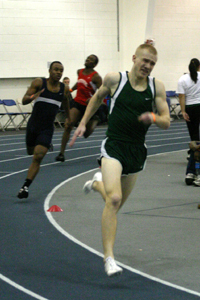 His time of 1:58.49 breaks the county record of 1:58.93 which he had set last year. Palmer finished right behind him in 1:59.17. Reumante finished in third and Zahorodny did not have another quick 800 in him as he dropped to 4th. 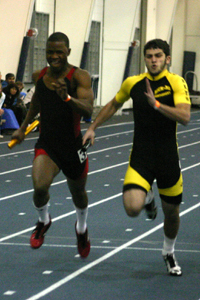 The meet culminated in the 4x400m relays. Northwest's Britt Eckerstrom once again established a lead for her team, this time on the third leg, before handing off to anchor Kathy Aherne. Churchill's Katie Wolf received the baton a few steps behind Aherne and quickly passed her. An eternity went by before Wootton handed off to Olivia Ekpone to close it out. 3rd place would have sufficed to secure the team title for Wootton, but instead Ekpone decided to try to close the impossible gap. She flew around the track in pursuit of Aherne who was likely tired from the 3200. She succeeded in closing the gap over Northwest, but Northwest took 2nd place by inches over Wootton. Churchill won the race in 4:11.89, but it wasn't enough to capture the team title. Wootton won the team battle 84-82 over Churchill. The Blair boys won convincingly without one of their usual runners Louis Varella. Quince Orchard was racing against the ghost of RM's 4x4 from the previous heat. By bettering RM's time, QO would have won the team county title. Instead RM's time of 3:36.17 held up over QO's 3:36.42. RM won their third consecutive county title. As for the dashes and field events, there were many stars of the show on the boys' side. Sean Stanley threw a ferocious 55-00.75 and set a new county record as only a junior. Gary Frazier set new county records in both the 55 meter dash and long jump respectively with marks of 6.5 seconds and 21-09. The near 22 foot long jump broke the previous county record by half a foot. RM teammate Tyler Jackson won the 55 meter hurdles and Damascus's Ryan Mullsteff won the high jump. The triple jump proved to be stacked as three different jumpers broke the previous county record of 42-02.50. Marcus Willacy of Paint Branch and Ian Francis of Walter Johnson both jumped 43-09. The winner was Northwood's Keenan Woods whose 44-05 triple jump thrashed the previous record by over two feet. 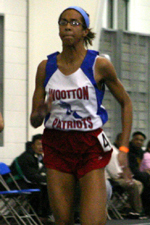 Wootton's Olivia Ekpone continued to make her mark in the county by winning the 55 meter dash. Kelsee Zyzak of Damascus upset event favorite Olivia Durr in the 55 meter hurdles with a win. In the jumps, Wheaton's Ashley Dabney, Wootton's Suzanne Falk, and Paint Branch Arielle Statham came out on top in the high, long, and triple jumps respectively. Sherwood's Arleigh Rose repeated as Indoor County Champion in the shotput with a throw of 35-11.25. The overall team scores showed Richard Montgomery taking the men's team title, barely edging out Quince Orchard 86-83.5. Despite having lost so much talent, Richard Montgomery is still a force in the county. As for the girls, Wootton edged out Churchill 84-82. The addition of Olivia Ekpone really made Wootton a major powerhouse to be reckoned with in the county. I would like to say that Wolf did not "stumble"... I'd also like to give props to Wil Z, Moen and Ekpone, they raced very hard. It's interesting to note Wootton's Suzanne and Katie Falk scored more than a third of WHS's total points to help them secure the win.